Kat's Blog: Summer Bash - Day 25! Today I'm welcoming Mickie Sherwood to the party. Thank you so much for being here Mickie. Hi, Kat. Actually, I’ve always had an interest in writing and until a few years ago, pushed it to the backburner. 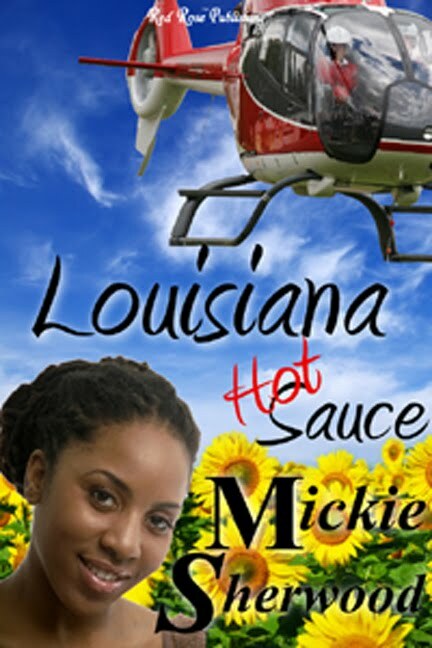 What prompted me to write Louisiana Hot Sauce was the outcry on multiple forums yearning for that sensual leave-it-to-the-imagination storyline in the multicultural genre. I decided to do something about it. Let me be clear, I’m not bashing anybody’s work because we all like different things at different times. I just wonder sometimes why people of different ethnicities can’t battle the odds and sometimes each other on their way to a sweet HEA or HFN. (Laughing) I guess I answered that question in #1. It sounds crazy but everyday nuances are my inspiration. Rituals? It depends on what part of the novel I’m working on. For instance, if it’s the highly charged climax to a situation, I find a brisk walk helps. Now, on the other hand, an emotional entanglement calls for something to soothe my soul. Just give me a nice big bowl of Baskin-Robbins Chocolate Almond ice cream, my easy chair, the drone of the TV and my laptop—and I’m good to go. Kat, I’m a little of both. I might begin as a panster but switch to plotter mode to fully develop an idea. That works for me because sometimes the movie playing in my head, (yes, movie—that’s what I said) needs to be edited, molded and formed up. This question is tricky. Let’s talk genres instead of favorites. These are just a sampling of my go-to reads. Romance—Sandra Kitt. Chick-lit humor—Janet Evanovich. Mystery suspense—Gar Anthony Haywood. Yes. I’m laughing my way through the early Joe and Dottie Loudermilk mysteries of Gar Anthony Haywood. I move away from the laptop and busy myself doing other things. Recently, the movies weren’t rolling in my head so it was a great time to hose down the front porch, including the rockers. I just love that country porch. The other day, I sanded a plant stand and painted it candy apple red. Now, that really made the porch pop. Wow, I guess that sounds like a lot of days with writer’s block, doesn’t it? I love to take pictures. I don’t mean me as the subject. Hate that. I take shots, mostly nature and scenic. You can see some of them on my web site. They are a focal point on my site that I change randomly just for fun. I’ve been to spectacular places surrounded by beautiful blue water. But I’ve never been to The Greek Isles. If you’ve ever watched those travel shows you’ve seen the shimmering white buildings against that gloriously blue ocean. It’s gorgeous. I’d love to see that up close and personal. Do your research. Ask questions. Don’t be intimidated. And grow in your craft. Hmmm. There’s not much to tell. I do like my romance novels tastier than parfait, sweet like pie and as satisfying as ice cream. So, readers can be on the lookout for more like that from me if that’s what they crave, also. Gladly. I like to refer to Louisiana Hot Sauce as a sweet, zesty read with just the right spice. It’s about two hearts attempting to overcome travesties of the past. Mesha has a hot temper that camouflages unfounded guilt. Jack harbors the painful sting of rejection. Their impromptu clash launches a relationship that hurdles them romantically towards a bright future in Happily Ever After. Louisiana Hot Sauce was a joy for me to write, Kat. I hope it suits the sweet tooth of its readers. I invite readers to visit Mickie’s Manor at http://www.mickiesherwood.com/. Loved hearing about how you handle writer's block. Must admit I never thought of sand blasting my furniture before, but am intrigued enough to maybe give it a try. And on that note i am going to wing on over to your blog and have a look around. I think the clue to his writer's blog cure is action. lol. Good interview, Mickie. Nice to know I'm not the only one who can't just bang his or her head against the writer's block and bash through it. Hi Mickie, I enjoyed your interview. Do you have any Louisiana connections. Just wondering since I'm from Louisiana and was wondering how you came up with the title. Continued success on all of your endeavors. P.S. I wish I had a porch on my house too.